As a test, go to Google or Bing or Your Favorite Search Engine and look for your site.Â Look for it as “Anytown Public Library” and “Anytown Library” and “Anytown Library Kansas” and any other combination of terms that a library seeker may use.Â What do you find?Â Are there other Anytown Public Library’s out there, say in another state, competing with your site?Â Does your site appear on your City’s site, or some other referring site? Also, if you found in your initial testing that there is community or City site that refers to your site, make sure it is up-to-date.Â Call, email, whatever it takes – your library Web site is an Amazing tool for promoting the library and you want to make sure people have the right address. As librarians, we catalog and classify things.Â How do we catalog and classify our Web site?Â With metadata!Â Depending on the WordPress Theme you use for your site, you may not have an easy way to add your own site description and keywords.Â Luckily, there’s a plugin for that! 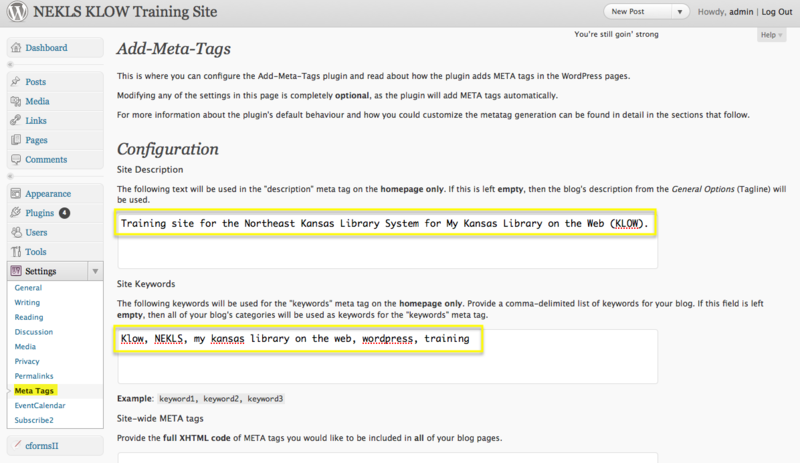 You can do a search for “metadata” from the Plugins section of your site’s dashboard or from the WordPress site.Â That’s how I found and installed this:Â http://wordpress.org/extend/plugins/add-meta-tags/.Â Using this plugin, I added a site description and keywords to a KLOW site. Let us know if you have found any interesting or unique ways to promote your library Web site!